Blues is a distinctly American musical form that has influenced music the world over. While many people believe you need to be broke, sad, and down-trodden to play the blues, the truth is, you can be a happy blues player. All it takes is the willingness to listen to the music and put some effort into studying the techniques and sounds that make up the sound of the blues. With a little bit of help from the team here at Guitar Control you’ll learn and master blues guitar in no time. Blues guitar licks tabs are available online. You can find lessons that cost money and you can find lessons free. 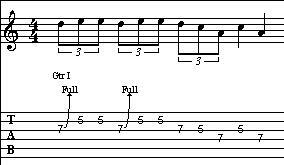 These lessons often come in the form of tab, which is a type of musical notation guitar players are familiar with. This makes it easier for those who choose not to read standard music to play blues licks and exercises. The example below shows a blues major in A, second position on guitar. Play it and listen closely to the flat three and raised fourth degrees. Try playing the notes and applying some of the traditional ornaments of the blues. Add some half and full step note bending, apply vibrato to some of the notes, and slide from one note to the next. This is a good way to get a feel for how the elements of blues technique turn these notes into what e expect to hear when we hear the blues. Blues guitar licks tabs are a great way to build your skills as a player, train your ear for the improvisational playing that makes up most of the blues, and develop the appreciation that goes along with playing the blues. Listening to other players is one of the best ways to expand your own vocabulary and gain appreciation for the genre too. If you’re ready to play some blues licks, grab a few blues guitar lick tabs from the Internet and play a twelve-bar blues progression to play over. Experiment with the different licks, string them together over the progression, and create your own blues solos from some of the classic blues licks you find.